Advanced care for Knee Arthritis & Sports Injuries. Schedule an Appointment with Dr. Marks Today! Dr. Marks offers his patients advanced care for orthopedic injuries and degenerative conditions. For patients with knee osteoarthritis, Dr. Marks offers Conformis customized knee implants. With traditional knee replacement procedures, the surgeon selects a “one-size-fits-all” knee implant for all patients. 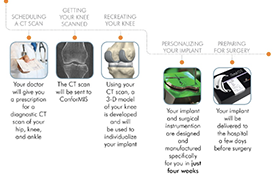 With Conformis, the implant is customized to each patient’s unique anatomy, for a more natural-fitting knee. Osteoarthritis is the most common form of arthritis, affecting tens of millions of people worldwide. It is a degenerative joint disease characterized by the breakdown and eventual loss of joint cartilage. The break down and deterioration of cartilage causes the bones to rub together resulting in extreme pain. OA rusting from “wear and tear” is the most common reason individuals need to undergo knee replacement surgery. Fill out the form below to reach Dr. Thomas Marks online, or call (603) 782-4337 for immediate assistance. Implants are designed from a CT-Scan to match your size and shape for optimal fit. Hear from real patients who have received a Conformis knee implant. Learn about the challenges they faced and see the difference a customized knee can make. Conformis™ can take an individualized approach – where nobody else does – using proprietary iFit® image-to-implant™ technology. Dr. Thomas Marks has been practicing as an orthopedic surgeon in our community for more than 30 years. Today, Dr. Marks is the founder and lead surgeon at Rockingham Orthopaedic Associates in Derry, NH.